Keep customer orders slips out of the way yet still visible with this 24" wall-mounted restaurant ticket holder. Designed to hold guest checks or order slips out of the way of your cooks while still keeping them available for reference, this ticket holder is a great way to increase efficiency and productivity in your kitchen. When mounted at eye level, the ticket holder makes it easy for your kitchen staff to stay organized and keep up with orders. These ticket holders are a godsend, we saved a ton of money compared to anything online or the depot, they come apart easy too so you can clean them. Very economically way to add more ticket holding. Been using these for over a year on our food truck and they look new. Highly recomend. I just received this ticket holder for my very bust restaurant.. I am happy to say for the money these holder are well worth the money.. Easy to install and the checks slide easily.. I love this product and the fact that you can hang it instead of having a ticket holder that sits on the counter and wastes space. This one is perfect. Perfect ticket holder to go above a salad or pizza bar. There are small rollers in the metal frame that allow tickets to easily slide into place without falling. Item works perfect for holding our weekly special tickets. Keeping track of when the orders come in are easier using this item. This item is awesome. This 24" ticket holder is the perfect size for sticking any tickets or guest checks regardless of length or size. It's sleek silver color keeps the kitchen decor minimalist and tasteful, while serving a useful purpose. I would recommend the 24" ticket holder for tighter spaces such as above small work stations. Built very sturdy and will not break or become overloaded during any rush. Great purchase. This ticket rail is decent. It's not as good as the San Jamar, but as long as your paper isn't too thin, it works really well. It holds tickets well but does not seem to be compatible for tough weather. Using this in our food truck, the orders will sometimes fly off of the ticket holder when it gets windy. bought one, haven't needed another. It's an excellent way to make sure that we have all the tickets organized to serve in the right order. Great ticket holder . shiny and clean and they look good in the restaurant easy to install and hold firm the tickets and the price is unbeatable . Perfect size for our expo side of the kitchen. has plenty of bearings/marbles and holds the tickets in place with out sliding around. great item especially for the price. Very easy to install, very solid material and I like the feature of it being a magnet holder, too. Great quality, no scratches and looks very clean. Would recommend. Does the job and the cheapest I have been able to find. No complaints, holds the tickets at our restaurant. Easy to install, and does not slip. This is an awesome piece of equipment! It helps us keep our orders organized in the back. The rolling balls in the device allow a sliding function on the tickets, which is convenient. Ticket holder made our food truck service a breeze. It allowed for everyone to see the displayed ticket and helped with accuracy of the meals we produced. The tickets slide right into the holder and won't budge until you are ready to remove the ticket. You can slide the tickets from left to right without any issues either. 24 inch restaurant ticket holder. Something that every restaurant should have. Easy to amount and install. Loud you to post your order tickets at I level or at any station so that you can keep them in order and identify what's on the tickets. This is the best purchase I have ever made. Excellent quality and easy to install. It holds the tickets very well and they come out and in really easy. Definitely buying some more when my business grows. It's good item for the price. I think the price is really reasonable. It looks good and works well. However, I bought other expensive ticket holder from Webrestaurant later and it was much smoother to move tickets from side to side. Small piece but very important , heavy duty. Place for 10 ticket. Easy to install. You can clean with water and soap no rust. Made with good and nice material. Even though we are a small taco catering company we bought two of these ticket holders to help us expedite our orders. The installation is very simple and fast. I also think this product is rightly priced. When we fist tried it, the ticket moves really fast left and right, so it's easy to pull one ticket out and put it in a different order for those orders that need to be placed on hold and redo. I am planing on buying more of these ticket holders once we grow the business. Took forever to get these and then there was a mess up on shipping...but they were worth the wait. Very glad I purchased these. They hold tickets very well and look nice in the kitchen. These are very economical and well worth it. We use them to hold the tickets on the make lines. We also use them to hold and sort out the delivery receipts for each driver. This is a must have in any kitchen. It's durable and cleans up easily and fits nicely on our shelves that we bought from Webstaurant. Good size, I probually should have bought the longer one. The ticket stay up even with busy movements all around. Ill probably buy one more. Works great in my small space. It was very easy to screw this to the front of a laminated wood shelf for a new prep station. Excellent for our kitchen. Worked perfectly as it fit flush with out countertops. Would recommend to anyone with a large kitchen as it fits anywhere. This ticket holder is of great construction. It the perfect fit for approximately 5-7 tickets at a time. Tickets move in and out of the ball bearings seamlessly. This is an excellent value. We have replaced our bulletin boards and pins with these. We use it to post our daily wholesale orders so our whole team knows what we are producing that day. We also use it to post everyone's daily jobs. When an employee starts, they can see their work list and take it with them to their station. It is so easy. this little ticket holder have help me so much, my ticket use to be blow away by my vent and now that i have this on the wall. it keep my order ticket intact. Easy to install anywhere in kitchen and comes with screws. Item works great in kitchen and holds tickets for chefs. Great value for the price. Highly recommend. This is a fantastic product at an unbeatable price. The rollers are simply glass marbles, which means, there are no metal bearings to worry about getting "stuck" or worn out. Works for different paper thicknesses, even super thin thermal paper. Totally recommendable. There are multiple lengths, so make sure you buy the one that works best for you! I mean, you are paying so little. It is about as far as your money will ever go. Ours still works like its brand new. This ticket holder is a wonderful addition to any kitchen. It hangs easily and really grabs the tickets. This is very easy to clean too. 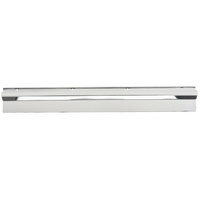 This ticket rail is made from quality stainless steel and filled with ball bearings to keep tickets in place. Adds a nice stainless accent to the walls of our food cart. I GIVE 5 STAR * * * * * ITS PERFECT FOR MY STORES LONG TIME BACK I LOOKING AND NOW I GET ITS PERFECT! I AM happy with our ticket holder. It is sturdy, and attached to the wall easily. It's easy to slide the tickets in and out, and it holds them securely. Good product for price. Holds our tickets perfectly. Hardware was included which is a bonus! Would buy again. Arrived quick and on time. Good value! We are happy with our ticket holder. It is sturdy, and attached to the wall easily. It's easy to slide the tickets in and out, and it holds them securely. Works pretty well for what it is. Not a highly technical item but does perform none the less. I would suggest to anyone who needs one that they get this product. This is a great small 2 foot guest check holder! We use it for a small dessert station! It securely holds a lot of checks!!! The 2 ft long guest check holder works perfectly in our tight space. It holds the checks sercurly and is easy to mount to the wall. Very high quality stainless steel construction with the balls or rollers plentifully arranged inside. Keeps track of your kitchen orders without them getting scattered or lost. Very good value for the money.